Gift giving can be difficult. It's hard to know what someone wants or even what someone already has. But one thing's for sure... if you're buying for a DIY-loving friend, they're probably interested in trying a new craft. So today we're sharing a different kind of gift guide - one that will help you assemble kit-style gifts for ten of our favorite crafty hobbies. Now that the temperatures are getting a bit chillier, I've been spending the evenings curled up on the couch with throw blankets and a warm cup of tea. And if you have too, then you might enjoy the tutorial that I have for you today... I'm going to show you how to make an incredibly simple faux fur throw blanket with fabulous yarn tassels adorning the corners. Click through to check out the full photo tutorial. This year, all my Christmas decor is leaning towards the paper-y and the handmade. So, when all my Christmas presents ended up getting wrapped in brown craft paper and old books, I knew the leftover red and green gift tag stickers at the bottom of my wrapping paper organizer wouldn't do. Make It: A Simple DIY Picnic Blanket for Summer! You guys, it's totally picnic weather these days. And picnic weather means picnic blankets! Here's a simple one you can make in an afternoon and be picnicking on by sunset! Make It: DIY Color-Blocked Coasters! I can't quite put my finger on it, but for some reason I'm a total sucker for coasters. Maybe because they're small, cute, and functional?? Who knows... But I do know that these DIY color-blocked coasters are just too fantastic not to share! It's no secret that I have an on-going love affair with felt. 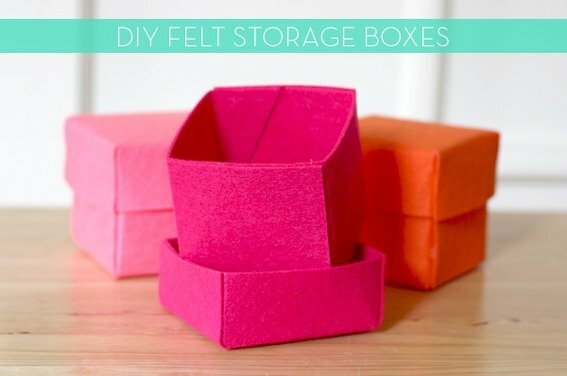 Add my obsession with little boxes and storage containers to the mix, and this DIY project is a no-brainer! Bare walls are the pits. Liven those bad boys up with some affordable modern art -- that you made yourself! Here are ten of our favorite DIY wall art projects to make this week. Roundup: 5 Ways to Decorate with Washi Tape! Ahh, washi tape. The craft-o-sphere's wunderkind! This seemingly all-purpose material can be found gracing the surfaces of everything from Easter eggs to vases and now... walls! Check out a few of our favorite unexpected decorative uses for this craft supply miracle! Roundup: 12 Unique and Modern DIY Easter Egg Ideas! Fluffy pastel bunnies and plastic grass be gone! We're celebrating Easter with some modern flair this year, starting with everyone's favorite activity: dyeing Easter eggs! Here are 12 totally unique techniques that will have you foregoing the grocery store kits and celebrating the season with egg-streme style!